The Hippopotamus Attack & Defence is a Hypermodern Chess Opening System which is Universal. 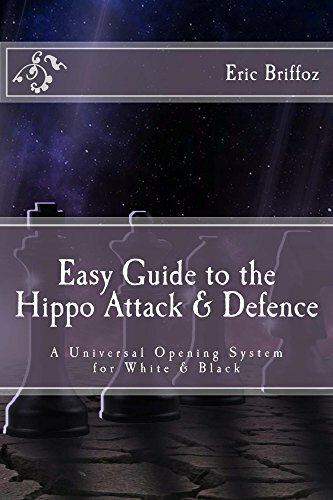 For the very first time in Chess History, its theory is explained and Grandmaster games are analysed in detail for both the Hippo Attack & Defence! Eric Briffoz is a Senior Computer Scientist, and Chess Player since he is 8 years old. In 1981 (age of 9) he joined his first Belgian Official Club. In 2013, he became the President of the Rebecq Chess Club in Belgium, which he founded. He is a student from International Master Michel Jadoul. At the moment of printing this book, his Major Chess achievements included the following: -Winner of 3 Open Blitz Tournaments on lichess.org -Vice Champion of Washington State USA in 1990 (Junior) -Victory against a FIDE Master. -Victory against a US National Master -Draw against Double World Correspondence Chess Champion Tinu Yim (Estonia), at the age of 17. -Tournament victory against 4 times Belgian Woman Champion. His peak ELO rating on lichess.org is currently 2125 (on the road towards National Master level).